Sir Arthur Helps, KCB, DCL, was an English writer and dean of the Privy Council, youngest son of Thomas Helps, a London merchant. He was educated at Eton and at Trinity College, Cambridge, coming out thirty-first wrangler in the mathematical tripos in 1835. He was recognized by the ablest of his contemporaries there as a man of superior gifts, and likely to make his mark in after life. 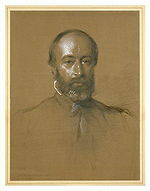 As a member of the "Conversazione Society", better known as the Apostles, a society established in 1820 for the purposes of discussion on social and literary questions by a few young men attracted to each other by a common taste for literature and speculation, he was associated with Charles Buller, Frederick Maurice, Richard Chenevix Trench, Monckton Milnes, Arthur Hallam and Alfred Tennyson. His appointment as Clerk of the Council brought him into personal communication with Queen Victoria and the Prince Consort, both of whom came to regard him with confidence and respect. In 1864 he received the honorary degree of D.C.L. from Oxford University. He was made a Companion of the Order of the Bath in 1871 and a Knight Commander of the Order of the Bath in the following year. His later years were troubled by financial embarrassments, and he died on 7 March 1875. It takes a great man to make a good listener.